Satellite Guide - Satellites for your caravan or motorhome made easy! We will start off with Satellite Domes and why they may or may not be suitable for you. Domes are a great option if you are just travelling the UK/Northern France, this is due to the size of the dish inside the dome, typically around 40cm. The one feature that particularly stands out with Domes is the fact the dish is all enclosed meaning that when we do have one of our many bad weather days here in the UK and winds are high, you have no need to retract the system like you may have to do if you have a larger roof mounted system (65cm or 85cm satellite dish). Maybe you have decided to go travelling into Europe? This is where you will need to go for the larger roof mounted satellite dishes. Firstly, the 65cm dish. 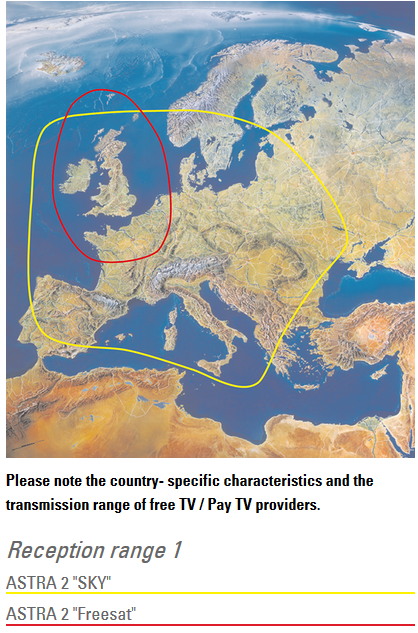 With this, you would expect to receive UK free to air channels up to around mid France and as you go further south you will start to see them drop off. If you want to maximise your range, you will want to go for an 85cm dish with an AutoSkew LNB. 85cm is the largest size for a roof mounted system and you would expect to see UK free to air channels up to around Barcelona in Spain and then as you go further into Spain you would start to see these channels drop off due to how limited we are on the free to air footprint of Astra 2. Need to know more? Call us on 01582 562277 and we’ll be happy to help! If you have a subscription to Sky and would like to pick up your subscription Sky channels (Sports, Movies etc) then you will be able to get these channels on a much larger footprint than UK free to air channels as seen in the accompanying image. The image shows a footprint of the coverage of an 85cm dish, everything inside the red ring is coverage for our free to air channels (please note this is underestimated so you will get further than shown) and everywhere within the yellow ring is coverage of our SKY subscription channels (You will need a sky subscription to be able to view these channels). Single LNB or Twin LNB? Deciding between a Single or a Twin LNB? What are the benefits? A single LNB will feed one receiver but if you are looking to feed two separate receivers or if you are looking to be able to do recording while watching another channel on a FreeSat+ or Sky+ box then the Twin LNB would be the option to go for. If you would like to discuss the various products available to you then please give our team a call on 01582 562277. Do you have Sky Q that you wish to use? Speak to us and we can advise you on the correct system to go for. S&G were the first company in the UK to develop a SKY Q capable system alongside Oyster.